To propose a consensus definition of severe maternal morbidity appropriate to the objective of increasing knowledge. To measure the incidence of severe maternal morbidity in the general population in France, both overall and for its principal components. To study the quality of severe maternal morbidity-related information in the hospital discharge statistics (PMSI) and propose a definition allowing it to be monitored from this permanent database. To identify the factors that increase the risk of severe maternal morbidity, including the characteristics of individual women, obstetric care before the onset of severe morbidity and the delivery hospitals, as well as the interactions between these factors. To design an early alert tool for severe maternal morbidity, to predict whether a severe morbid event will have an unfavorable course, toward a “near-miss” or death. To propose a method for assessing the quality of care of severe maternal morbid events. To measure the quality of care provided in severe maternal morbidity events in France today and to identify potential improvements. 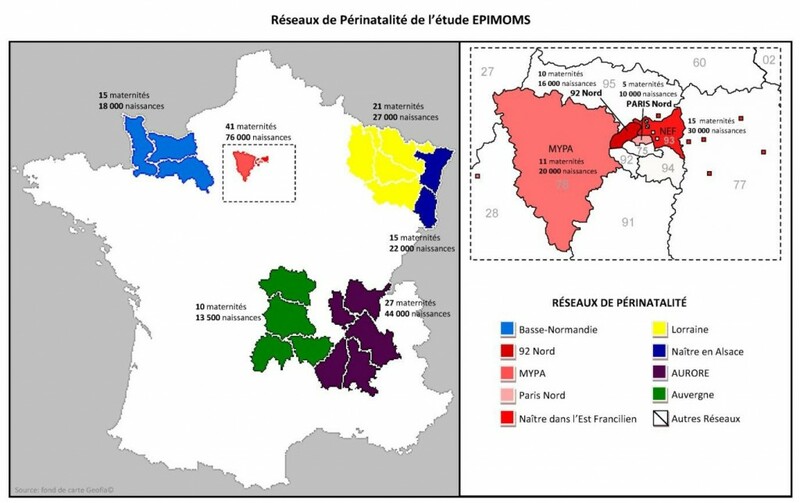 EPIMOMS is a population-based study conducted in 9 perinatal networks in France (6 regions) (Figure 1) from May 2012 to April 2013. Cases were identified from all the maternity units, adult intensive care units, emergency departments, and mother-baby units in the areas participating. The data collected covered social and demographic characteristics, medical and obstetric history, the course of the pregnancy and delivery, and a description of the morbid event and its management. Information about the characteristics and organization of the maternity units was also collected by a specific questionnaire. EPIMOMS is a collaboration between the Inserm EPOPé team, 9 perinatal networks, the French Society for Anesthesiology and Critical Care Medicine (SFAR), and the Pôle IMER (medical information and research evaluation) of the Hospices Civils de Lyon. The EPIMOMS study received funding from the ANR white program in 2010 (440 K €), and the Ile de France regional health agency (65 K €). Inserm U 1153, EPOPé team, coordination: Marie-Hélène Bouvier-Colle (Study codirector), Catherine Deneux-Tharaux (Study codirector), Coralie Chiesa-Dubruille (Midwife and national coordinator), Anne Chantry, Aurélien Seco (statistician). Elie Azria (Paris Nord perinatal network), Nathalie Baunot (Naître dans l’Est Francilien perinatal network), Marie-Pierre Bonnet (Société Française d’Anesthésie Réanimation, Inserm 1153) , Gaël Beucher (Basse-Normandie perinatal network), Cyrille Colin (Hospices Civils de Lyon, pôle IMER), Catherine Crehn-Hébert (92 Nord perinatal network), Michel Dreyfus (Basse-Normandie perinatal network), Corinne Dupont (Aurore perinatal network), Jeanne Fresson (Lorraine perinatal network), Nathalie Hochin (Paris Nord perinatal network), Gilles Kayem (Inserm U1153, 92 Nord perinatal network), Bruno Langer (Naître en Alsace perinatal network), Alexandre Mignon (Société Française d’Anesthésie Réanimation), Patrick Rozenberg (Maternités en Yvelines et Pays Associés perinatal network) , René-Charles Rudigoz (Aurore perinatal network), Françoise Vendittelli (Auvergne perinatal network).